One of my favorite restaurants in Asheville where I used to live was raw. I considered dining there a rare treat and never really considered making raw food for myself. I had it in my head it was far too labor intensive…all that slicing, dicing, culturing and sauce making. But lately, I’m having quite a ball exploring the world of easy-to-make raw dishes. For a couple of years now, I’ve observed myself looking at raw food sites online, fantasizing about the colorful cuisine and dreaming about going off to some raw food cooking school. It finally dawned on me that “not having the right equipment” or “the amount of things I’d need to buy to even start” were not sufficient excuses to just diving in. I’ve been asking myself lately the things in life that bring me the most joy. Healthy food certainly fits that bill…both in the making and the eating. So I decided no more excuses. I’d start simply and work my way up. Not one for following recipies to the letter, ever, I skimmed some “easy raw food recipes” online to get a sense of the ingredients and ways to prepare things. Then I worked with what I had and made some experiments. I’ve been loving my raw food creations so much that I decided to share some of them here with all of you. I love food. I love the way it looks and the way it tastes. But I’m also a very picky eater. There are many foods I just won’t eat no matter how “gourmet” they are. Food should elevate the body, mind and spirit. Food should be fresh and full of life…and prepared with the highest intentions. 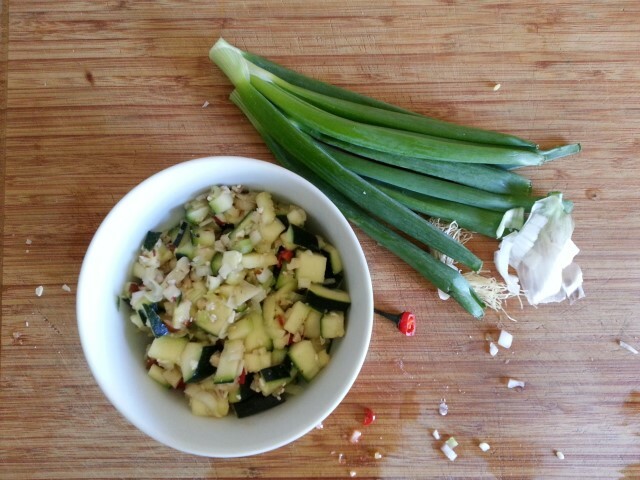 I hope you try this dish and discover just how easy and enjoyable it can be to eat raw too! Dice or spiral some fresh, organic zucchinis (about three cups worth) pondering the springy texture, subtle fragrance, and rich green skins. Mix while reciting the mantra, “OMmy goodness!” and eat! Zesty Zucchini Salad looks awesome beside and tastes great together with my Tahini Carrot Salad.